Let me explain the reason of my sudden missing in action for the past 2 months. The kids starts their long school holidays and bring all 3 of them to Hanoi for holidays while visit my hubby who working there at the same time. We stayed there for 1 month and spend the quality time together. My hubby have been there working for about 2 years and I can proudly said that he now can understand and speak vietnamese(wink*). What is it so proud of it?? *** Believe me, vietnamese language is not easy to master. Each word sound so funny to me and worst is, they have many different meanings which will bring us to trouble when we use it wrongly. When he first stepped his foot there. He don't understand even a word of the vietnamese language, not to said their culture or places. Till now, he still can't remember all the name of the streets there but luckily he hire a vietnamese to be his loyal driver. No one can move around in the city of Vietnam without a good driving skill - kudos to them!!. Vietnam, especially the Ho Chi Minh city and Hanoi city are said to have the most terrible traffic system. Dare you drive a car or ride your own bike there?? I have been to Ho Chi Minh once and Hanoi for more than 5 times. I have tried almost all of the food there and today I want share some of the food we ate during our stay there. I hope this will gave all of you a rough idea on what the local people there normally eat. 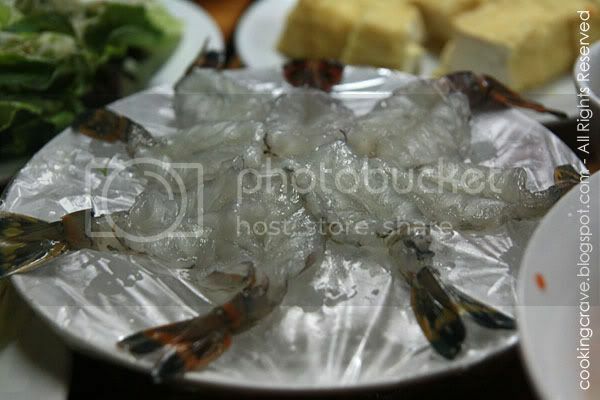 Prawn Sashimi - We can eat it just like that, dipped with the sauce of our choice or wrapped it in the rice springroll skin together with some herbs, vege & fruits (starfruit/mango) of our choice. 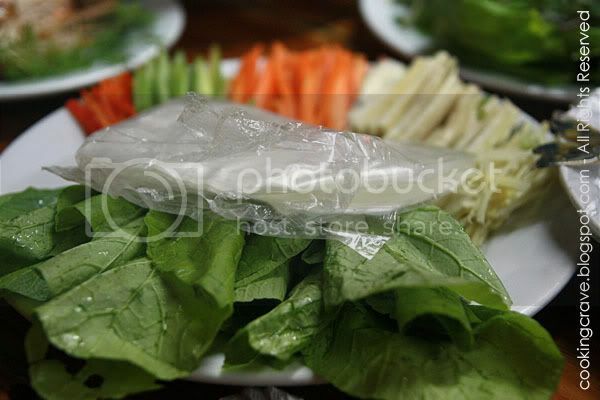 Above are the paper look-alike made from rice, springrolls skin. 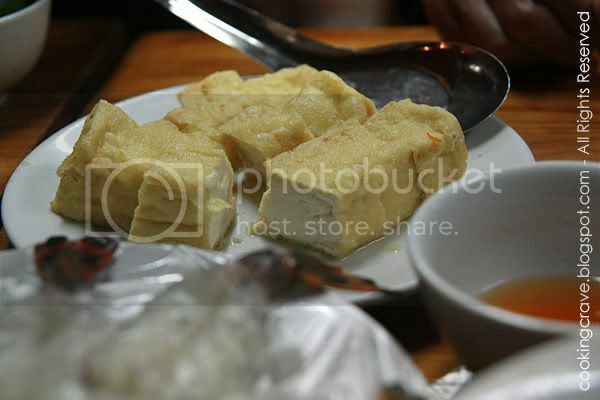 Side dishes - Fried beancurd. 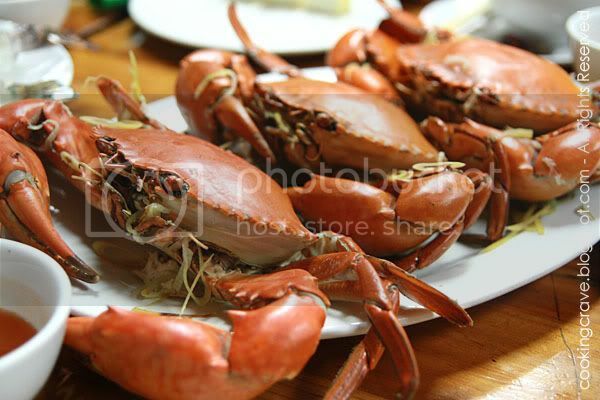 Crab - A must have!! My favourite part when eating crab...hehe! 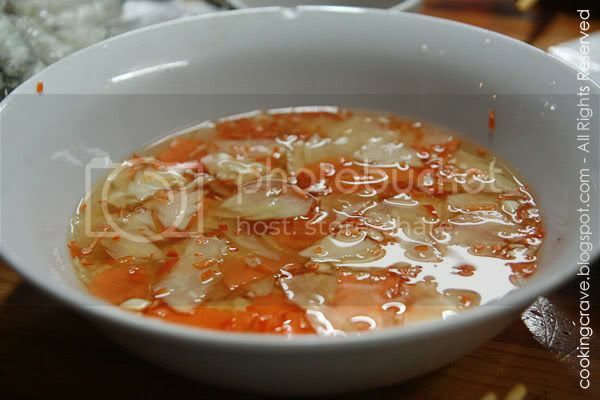 This taste just like our "Acar Timun"
Arrh!!! It takes me like forever to upload my pictures into photobucket. I think I better upload them again in my next post. My dear friends, I have been busy with school re-open where now I have to send my eldest son to the secondary school and my 2 princess to the different primary school. I still cannot make up my time to exploring my baking adventure. 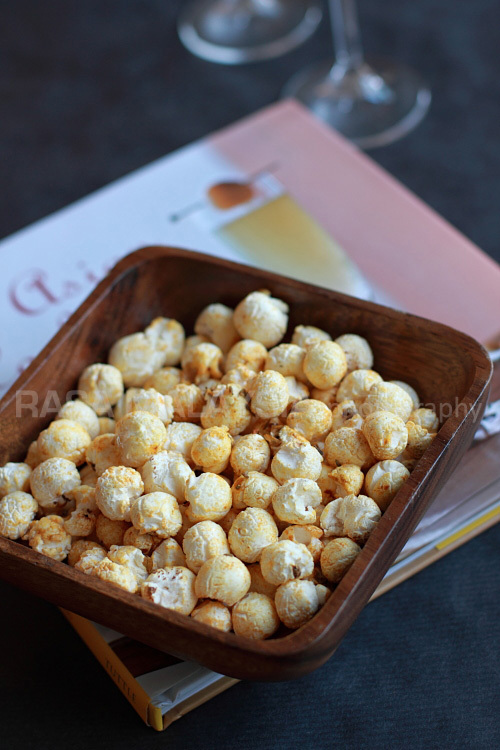 I hope to be back sharing with all of you my cooking soon. I wish all of you a nice weekend, enjoy!! 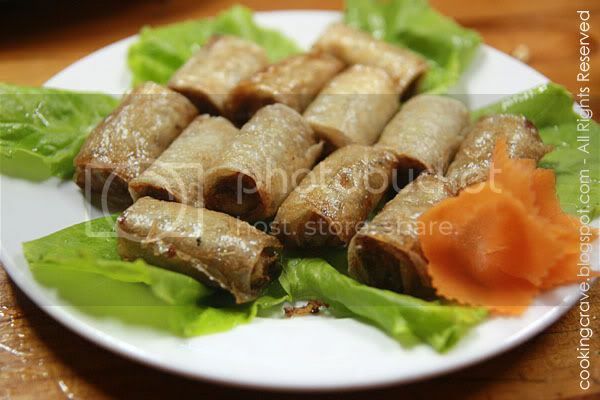 The Minced Pork Rolls looks very interesting, I'm curious about the flavor with the herb. Can't wait to see more new posts! 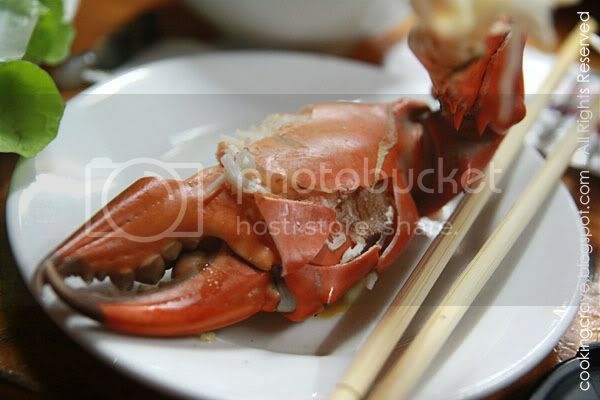 The photo you took of the crab is really making me hungry. Would definitely love to hear from you. Nice to see you back to post. I love Vietnamese foods, too bad i can't followed my husband to Hanoi last week, like you, I have to take care my kids.You too have a good weekend. 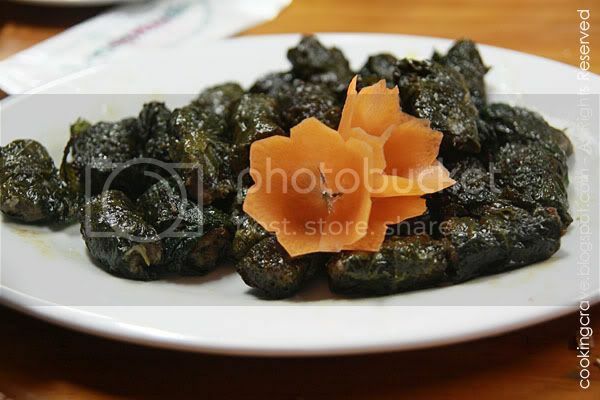 this all looks so good...the first dish is called bo la lot(betel leaf wrapped beef) although you can stuff it with a variety of meats....congrats on your husbands success!! Hey, Amy!! Welcome back!! Looking forward to more of your blog posts! Keep it up! I've already bookmarked your peanut cookie recipe! Thanks for sharing! Your hubbs is so adventurous & multi-talented! Your stay there sounds fun! I perfectly understand how it feels when your better half lives a distance away from you.